You may remember back in February we announced we were going to extend our test programme to include light commercial vehicles. Well, testing has been underway for the last few months and we have found that fuel economy and nitrogen oxide (NOx) emissions vary considerably depending on whether or not vehicles are fully laden. Our sample is currently small, but we wanted to share some early results. A van used for work is rarely empty so unlike the official tests, our cycle is repeated twice, first empty and then again at 100% payload. 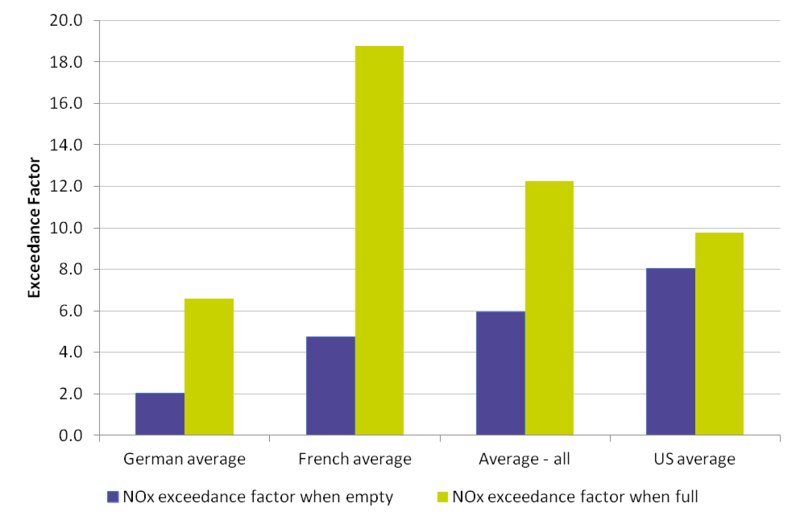 We have tested a number of the most popular Euro 5 vans on the road today and the average impact on fuel economy and NOx by manufacturer when driven fully laden can be seen on the graph below. Across all vans we have tested, NOx levels are 5.9 times the Euro 5 limit of 180 mg/km when tested empty on our real-world route. Fill these vehicles to 100% of their individual payloads and this ‘exceedance factor’ increases to 12.2 times the legislated limit. However, the impact of load varies from vehicle to vehicle. For instance, Volkswagen produces the cleanest van for NOxwhen empty and despite a 225% increase when full, this vehicle is still the cleanest we have seen. The Ford vans, on the other hand, are higher than the Volkswagen unladen (7.1 times the limit) but this barely increases when full (to 7.6 times), leaving them only marginally more emitting than the Volkswagen. Like passenger cars, vans deliver a worse fuel economy on the road than during the official NEDC cycle. The average for the vans we have tested is 14% below official MPG figures when tested empty. Fill them up and the average MPG drops to 27% below the NEDC figures. Just like NOx , there is variability between different models. So far, the Renault gets closest of all the vans tested to its official MPG result (2% below), but suffers badly when laden, dropping a further 13%, whereas load has the smallest impact on the Citroen with a 5% penalty. It is also interesting to note that there is very little variance between urban and extra-urban driving, for example at 50% load. 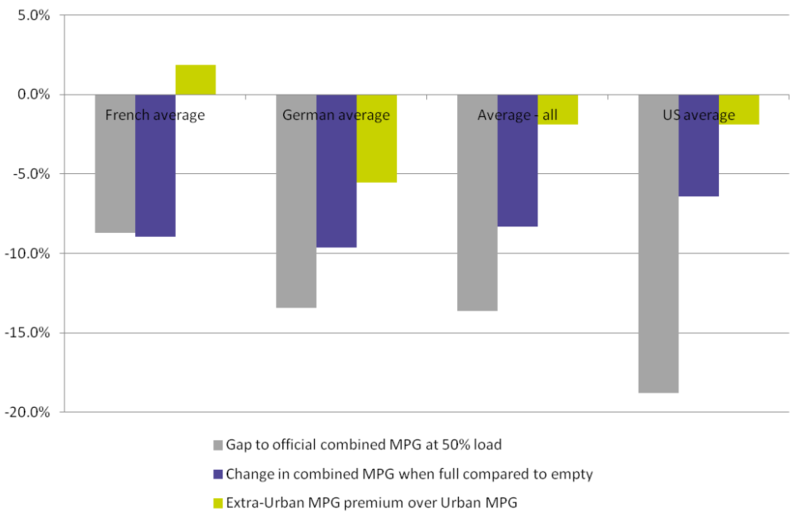 Typically, unladen, extra-urban MPG would be higher than urban, but the increase in rolling resistance means than on average we found MPG at the higher speeds was 2% lower than in urban driving. Our programme of van testing is on-going and will grow in 2016. The data so far shows – potentially even more so than for cars – that it is vital to match the right van to the right usage. There are very different characteristic performances between the vans tested so far, making the best purchase decision highly dependent on whether it will be used mainly for urban delivery driving, long distance trunking or carrying heaving loads.